Free Shipping Included! 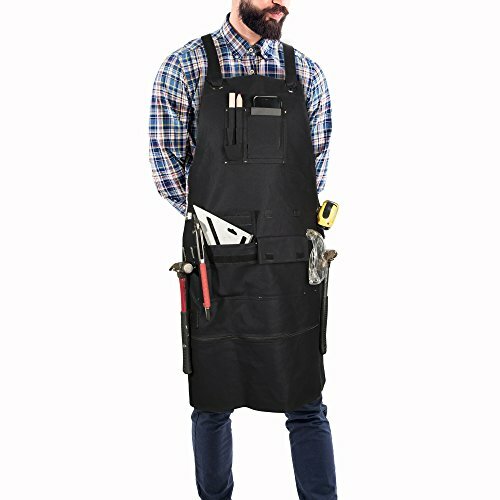 Premium Waxed Canvas Tool Apron with Metal Tape Measure Clip, Metal Hammer Holder, Metal Buckle, Adjustable Length 29-36in, Adjustable Back, Heavy Duty Woodworking Tattoo Barber Work Apron by Mont Bermion at N Online Agency. Hurry! Limited time offer. Offer valid only while supplies last. Trendy Gear for the Fixer-Upper In All Of Us The Mont Bermion Canvas Utility Apron is that item in your toolshed you didn't know you were missing. View More In Tool Aprons. The Mont Bermion Canvas Utility Apron is that item in your toolshed you didn't know you were missing. And once you have it, you'll wonder how you got anything accomplished without it. Designed from heavy-duty, waterproof canvas, chrome color metal fittings, embossed hot stamp PU leather details, and gunmetal eyelet rings, this apparel is as handsome looking as it is functional. Forgo tool boxes, utility bags, carpenter belts, and tactile jackets. Our tool belt bib is all of these things rolled into one, fashionable display of professionalism and quality. Hammers, tape measures, phone, notepad, pencils, sharpener, screws or equivalent, and hand-held tools of different sizes. WORK FASTER AND EFFICIENTLY: One hand is all you should be using to grab and put back your tape measure and hammer! Don't settle for nylon webbing hammer holders! The metal fittings on this work vest will make you the fastest, safest and most effective workshop professional from them all. The free A7 notepad will be in its designated pocket ready, next to your phone and pencils, to take on any project! SHORT? TALL? We got you covered! Our aprons are 2 inches longer than others, at 36" long. Simply unzip the extension hem and you're now wearing a 29" apron. No other apron can do this! Great for women, lighter jobs such as fix-out carpenters, on-the-go electricians or any barber or tattooist needing a light apron! NO TYING ROPES EVER AGAIN: Set the Apron to fit once and forever enjoy it, using the handmade cross-back point which keeps any weight evenly distributed, no sore necks guaranteed! Be the fastest and best looking builder in the workshop! WELDING? NO PROBLEM! Our premium waxed canvas is a heavy-duty classification 16oz thread count. Even our #20 double nylon stitching is fully waxed! It is NOT combustible, it will NOT leech on your clothes like others, it's lighter and more breathable compared to others. It has no wax on the inside to keep your clothes wax free, unlike others! THE MB PROMISE: At Mont Bermion "Quality is the priority"; We offer replacement or full refund if not satisfied for any reason within 90 days of purchase. BUY NOW and add the 'Midas Touch' to your next project! If you have any questions about this product by Mont Bermion, contact us by completing and submitting the form below. If you are looking for a specif part number, please include it with your message.